Sometimes the simple things in life are the best things. When something is stripped of complications, it can make us appreciate its core purpose more. Let’s take butcher paper, for example. At Oren, we offer different versions of butcher paper like custom printed butcher paper with logos for restaurants and delis, but we also offer quality unprinted white and pink butcher paper. Where does plain butcher paper come in? 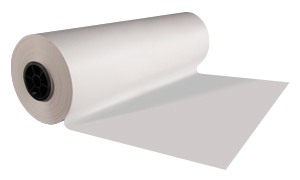 Our certified CounterKraft™ butcher paper from Georgia Pacific is of the highest quality and comes in a variety of widths/sizes to fit different needs. The simplicity of plain butcher paper can generate some creative opportunities. Here are a few ways that you can use butcher paper outside the deli case. Many children’s art projects call for butcher paper because it can be durable for young children and adaptable for a variety of projects. Try taping a large piece of butcher paper to the floor for a fun, floor drawing art experience. Looking for more ideas? Tape butcher paper to the wall for a photo backdrop and draw any scene you want on it. School, community or private events are perfect for a simple banner made of butcher paper. Because it can be drawn on, cut, and folded in different ways, butcher paper banners are great for all ages. If you’ve ever attended a crawfish boil, you know the drill. After boiling an array of food together like crawfish, corn on the cob and potatoes, the mix is spread out across a long table for a buffet style meal. White or Pink Butcher paper serves as the perfect cover to protect the table. With the holidays approaching, many people will be making a dash the store for last minute wrapping paper purchases. One creative and economical way to wrap your gifts is with butcher paper. The simplicity of the paper will make gifts look attractive and uniform. To embellish your gift-wrap, add decorative ribbons, yarn or bows to dress up the package. Looking for more ways to use plain butcher paper? Contact us today to find out how we can help you keep it simple with butcher paper.